Active Whitehorse News – November/December 2018 | Whitehorse Active Transport Action Group Inc.
What is the value of a street where people can walk safely? Why build streets that are constructed with the needs of people in mind, not just the needs of cars? London research confirms the benefits for traders. One, two … or more wheels? Building Strong Communities – 2. Swearing, horn honking and gesturing found to be highest among drivers aged 18 to 34. In a recent survey, Australian drivers admit to road rage in response to cyclists. About one in five Australian drivers has admitted to experiencing road rage or acting aggressively towards cyclists, according to a new survey of almost 2,000 motorists. The survey, released by Ford Australia, found that road rage was highest among people aged between 18 and 34 – 23% of whom admitted to swearing, honking their horn or making hand gestures when passing a cyclist. It found one in 10 drivers experienced this type of road rage at least once a month. See shocking video of a violent road rage incident in Melbourne, which highlights attacks on cyclists. The dashcam video shows a cyclist travelling along a road in St Kilda before a four-wheel-drive swerves into him and knocks him off his bike onto the footpath. See video and read the full report in The Guardian. Who can be seen by whom? Click the image to find out who can be seen. Heavy vehicle and truck blind spots block out a lot more of the road than people who ride bikes realise. Sharing the road with trucks is an everyday experience in Melbourne. From arterial roads to residential streets, you can expect to find trucks or heavy vehicles or nearly any road in Victoria. Because of their size and width, trucks have blind spots in front, on the sides and behind them. The drivers of heavy vehicles are professionals and are adept at piloting their huge transporters in traffic and through intersections. However, it’s important for people who ride bikes to remember that for all their driving prowess, drivers of heavy vehicles simply cannot see what their mirrors don’t show them. Large vehicles, such as trucks, tourist coaches and buses, are a challenge for people who ride bikes because they take up so much room on the road. Specifically, large vehicles occupy the space that bike riders are generally accustomed to having available to pass on the left-hand side when there isn’t a bike lane. However, when sharing the road with larger vehicles, the left side is a highly risky place to be. Check this excellent Bicycle Network information about “Swapping Seats” with the truck or bus driver. WHITEHORSE Council has denied VicRoads permission to take over a picturesque pathway in Blackburn for a multi-million dollar bike path. As work on the road rail separation gets underway, the council has again sided with hundreds of people who are objecting to a southern alignment for the Laburnum and Blackburn section of the Box Hill to Ringwood Bicycle Path, also known as the shared use path. The council has agreed in principal to VicRoads’ proposed route for the overall path, for which the State Government allocated $14.5 million in the 2015-16 budget, but has knocked back its plans for the most contentious section through Blackburn. Cr Denise Massoud said VicRoads needed to keep its hands off Elmore Walk, a gravel walking path through a quiet and well-vegetated part of Blackburn. Cr Massoud said VicRoads needed to pursue an alignment on the north side of the railway line. “VicRoads is clearly shying away from spending the money that’s needed to do this properly,” Cr Massoud said. A petition presented to the council included 430 signatures from people demanding a northern alignment. Cr Ben Stennett said the southern alignment would create more safety issues between cyclists and pedestrians accessing trains and buses at Blackburn station. Two years and eight months have passed and NOTHING HAS CHANGED! Vic Roads promised further community consultation, it didn’t happen. VicRoads promised full consultation with Whitehorse Council, but WATAG believes that any consultation has been, at best, simply a restatement of what VicRoads wants rather than a full examination of all options to meet Council’s and the community’s needs In the two years since the grade separation at Blackburn Station/Blackburn Rd was essentially finished, and the shared path to Nunawading and further east to Ringwood was initially laid, the community is still waiting for shared path to be finished. WATAG understands that the link between Box Hill and Middleborough Rd is apparently now being planned, and a vastly improved crossing over Springvale Rd is also apparently being planned. Works between Mitcham and Ringwood have now been virtually finished. What’s missing is the link between Middleborough Rd and Blackburn Station. When the report above was published, a VicRoads spokesman said “there were several reasons why VicRoads considered the southern alignment to be the safer option, which included the likely increase in pedestrian traffic on the north side in the future, a wider footprint than the north side, and loss of carpark spaces with a northern route.” Well, he was correct about likely increased pedestrian traffic on the north side of the railway line. Major unit developments on the north side midway between Laburnum and Blackburn Stations, will mean that there will be a lot more people wanting to access these stations. Consequently it makes total sense that there should be a path along the northern side of the railway line to accommodate this need – and not an on-road route along the south as proposed by VicRoads. Which is exactly what the Council and the Community proposed back when all the work was underway. WATAG recommends that ALL other work associated with the entire shared path be finalised first. We then recommend that Council, VicRoads and the Victorian Government fully re-examine ALL OPTIONS of how to provide a solution for what will then be the only “missing link” between Middleborough Rd and Blackburn Station. 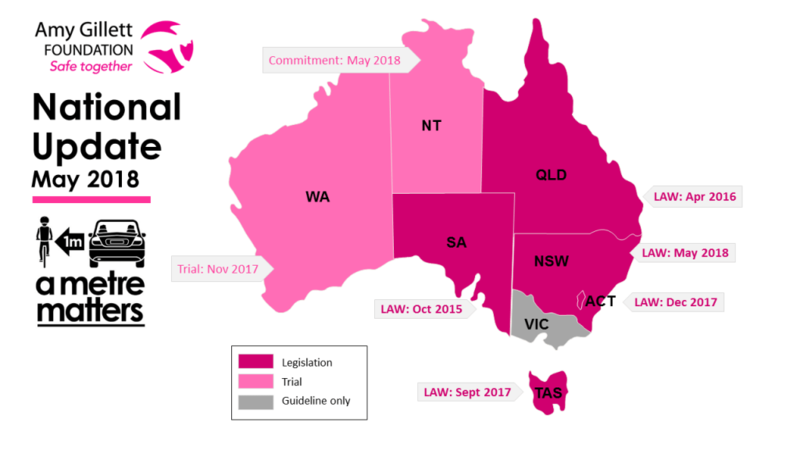 Bicycle Network reports that the ACT government has decided to keep minimum passing distance laws, following a report that found the number of crashes has reduced during the three-year trial period. Road Safety Minister Shane Rattenbury is expected to announce on Thursday that the territory will permanently adopt the road rules which requires drivers to stay one metre clear of bike riders when overtaking them in speed zones of 60km/h or less, and 1.5m in speed zones greater than 60km/h. Read the full report here. Bicycle Network also advocates strongly for Victoria to introduce a minumum passing distance law. WATAG believes a Metre DOES matter – refer here. Walk to School 2018 ran from the 8th of October through to 2nd November – so its now all over. Bicycle Network recently released its review of its policy on Mandatory Bicycle Helmets. It has rersulted in fierce debate between those who agree and those who don’t. It’s a very interesting report and worth reading the executive summary at least Instead of arguing about helmets, WATAG believes that all that negative energy should be put to positive use. If everyone concentrated on matters which will have the maximum effect on getting people to use Active Transport options instead of a car – cycling participation rates would dramatically increase. Speed reduction of cars in all suburban streets to 40kph or preferably 30kph together with corresponding traffic calming measures to help enforce that, so that people can take back the streets from cars. On-road bike lanes to be totally contiguous at all intersections, and clearly identified. Introduction of user-pays on-street parking indents (into the nature strip) for residents on busier roads who want on-street-parking where there are bike lanes. Then totally prohibit parking in a bike lane – anywhere. Driver education to reduce the anti-cycling attitudes noted earlier in this newsletter. These are the conditions prevalent in places like the Netherlands, which we have highlighted in earlier newsletters – places where cycling conditions are so much safer that wearing a helmet can indeed be mandatory. Lets get the conditions right, then talk about helmets! It was previously noted that “What promised to be a collaborative community consultation is steadily proving to be just another PR job (more cleverly executed than other recent examples)…” Fortunately NELA appears to have broken that mould and the final session of the NEL Community Technical Discussion Group (CTDG) – walking & cycling, held early November 2018, was the most positive of all. WATAG was well represented and had a big impact on discussions. Other groups represented included Boroondara BUG, Manningham BUG and the Institute of Traffic Engineers Australia and New Zealand (ITE-ANZ). It is important to note that the CTDG members were NOT party to discussions about whether the North East Link (Option A) – and its effect on the Eastern Freeway – is in fact a project that is in the best interests of the community or not. Discussion has totally been about the Active Transport impacts if Option A goes ahead. ITE-ANZ President reported in their latest newsletter. I have been attending Community Technical Discussion Group meetings for the North East Link project on behalf of ITE-ANZ. Our purpose is to advocate for better facilities for active transport modes. To illustrate: if a person living in Greensborough works in North Balwyn and they would like to cycle to work rather than take their car then they should be encouraged to do so. The level of service provided to active transport modes should be equal to that provided to motorised modes. In other words, the bicycle path should be direct, have low grades and be free of traffic lights. Unfortunately, we were advised that the concept design which is currently proposed to be put to bidders does not have such a requirement and is locked in and can’t be changed. The Community Technical Discussion Group members were very unhappy with this advice and with the low level of provision for cycling. After some vigorous discussion at the meeting a couple of members resigned because they felt they were wasting their time. At the latest meeting, the Project has now had a change of mind and agreed to prepare a report including all of the Community Technical Discussion Group’s proposals. This report would be provided to the bidders to inform them of community expectations. This is a big change of approach by Project staff. I complement them for listening and now taking an innovative approach to community consultation. Let’s hope that the NEL will set a new level of provision for active transport and becomes a model for future projects. WATAG totally agrees. The aim should be for AAA (All Ages and Ability) Active Transport infrastructure to match the top grade standard of service that will be provided for cars and trucks. And the development of “Expert citizen” engagement such as this, (as noted in the article above on Building Strong Communities), bodes well for the future. The Holiday Season is just around the corner, so right now is the time to get your community looking its best. Snap Send Solve is the quickest and easiest tool to help you do just that. And Whitehorse Council now subscribes to SnapSend Solve as reported in the last newsletter. By sharing the results of the great work your council or other authority have done in keeping your neighbourhood beautiful, you automatically go into a draw to win some great prizes. Check it out here. … Merry Christmas to all! WATAG is registered as a charity with the Australian Charities and Not-for-profits Commission ABN 63 938 570 447. Being registered as a charity with the ACNC demonstrates WATAG’s commitment to transparency and good governance.